As a result of years of study, psychologist Dr. John Gottman can watch a married couple interacting (like at a party) and within three hours predict with 94 percent certainty whether that couple will stay married or divorce. Sound unbelievable? Well, in an Atlantic article, Gottman revealed the keys to a good marriage—kindness and generosity. Gottman and his wife Julie, also a psychologist, are renowned experts on marital stability and run The Gottman Institute, which is devoted to helping couples build and maintain loving, healthy relationships based on scientific studies. Contempt, they have found, is the number one factor that tears couples apart. People who are focused on criticizing their partners miss a whopping 50 percent of positive things their partners are doing and they see negativity when it’s not there…. Kindness, on the other hand, glues couples together. Research independent from theirs has shown that kindness (along with emotional stability) is the most important predictor of satisfaction and stability in a marriage…. You can think about it as a fixed trait: either you have it or you don’t. Or you could think of kindness as a muscle. In some people, that muscle is naturally stronger than in others, but it can grow stronger in everyone with exercise. Masters tend to think about kindness as a muscle. They know that they have to exercise it to keep it in shape. They know, in other words, that a good relationship requires sustained hard work. When I read this article earlier this week, it reminded me of the vital importance of working on marriage everyday—when things are going well and particularly when things are not so well (like during a fight). Sometimes, it’s so easy to focus on the negative, but how much nicer it is to focus on kindness and generosity of spirit. I hope to be more mindful of this. There’s evidence that shows the more someone receives or witnesses kindness, the more they will be kind themselves. I can’t help but think of my little one. You know that I want him to grow up to be a healthy and happy little citizen of the world, but more importantly, I want him to be a kind one. That means I need to exercise my muscle of kindness in marriage, at all times, because healthy relationships require sustained hard work. 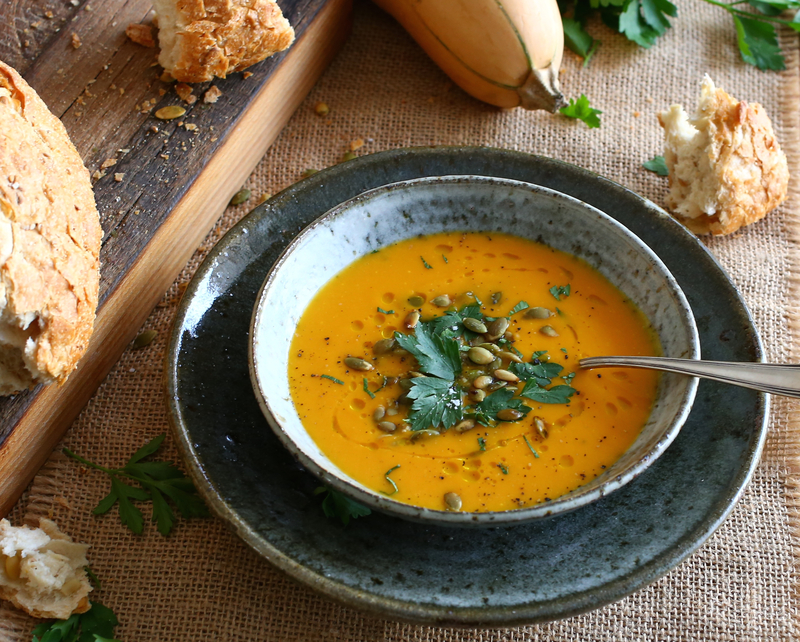 This is a simple, delicious and rich butternut squash soup made with sweet potato and a little honey. I made slight adaptations to the original recipe to make it vegan. Halve butternut squash lengthwise, scoop out seeds and place squash on a cutting board cut side down. Remove peel using a sharp knife or strong vegetable peeler. Cut flesh into 1-inch cubes. Peel sweet potato and cut into 1-inch cubes. Heat olive oil in a stockpot set over medium heat. Add onion and sauté until translucent, about 3 minutes. Add squash and sweet potato and cook for 5 minutes. Stir in honey and cook for another 5 minutes. Add milk and water and bring to a simmer. Lower heat slightly and gently simmer until squash and potatoes are tender, about 30 minutes. Working in batches, transfer the soup to a blender and purée until completely smooth. Pour soup back into stockpot and bring it back up to a simmer. If the soup is too thick, loosen it with just enough broth or water so the soup has the consistency of heavy cream. Taste and adjust the seasoning with some salt, a generous amount of black pepper and a bit of honey, if needed. Ladle into bowls and garnish with a drizzle of oil, chopped parsley, pumpkin seeds and freshly ground pepper. Serve with country bread. I’m lucky that I have a kind and generous husband. I’m happy that my kids take after him. I think I’m pretty generous, but not always very kind. Working on it every day, promise! 🙂 This is a particularly helpful recipe for me, having both butternut and sweet potatoes. They always stump me! Never know what to do with them! Hi Isabella, Thank you for stopping by and leaving kind words. I hope you like this soup! Such a nice article. This is like a reminder for all of us. Always look at the positive things in ur partner and ur relationships, rite?! Good one. N luv the soup recipe and ur food styling and photography. Thanks so much Sadia! I’m glad you enjoyed the article, recipe, photography, and food styling. With the last two, as an amateur photographer and relatively new food blogger, I’m trying to learn a little more about food photography with every post. I consider myself (and the blog) a continual work-in-progress. Thanks for your kind words! Such kind words Fae. Thank you so much. Wonderful to hear that you and your husband are masters who are so committed to making your marriage thrive! Thank you for raising a kind and generous person who is now a part of our global community. Love the ‘Kindness vs. contempt’ idea. You are certainly treating your family with kindness with this delicious soup!! Thank you Liz. The idea of kindness vs contempt IS thought provoking isn’t it? The article, for me, was a great reminder of the importance of true kindness. 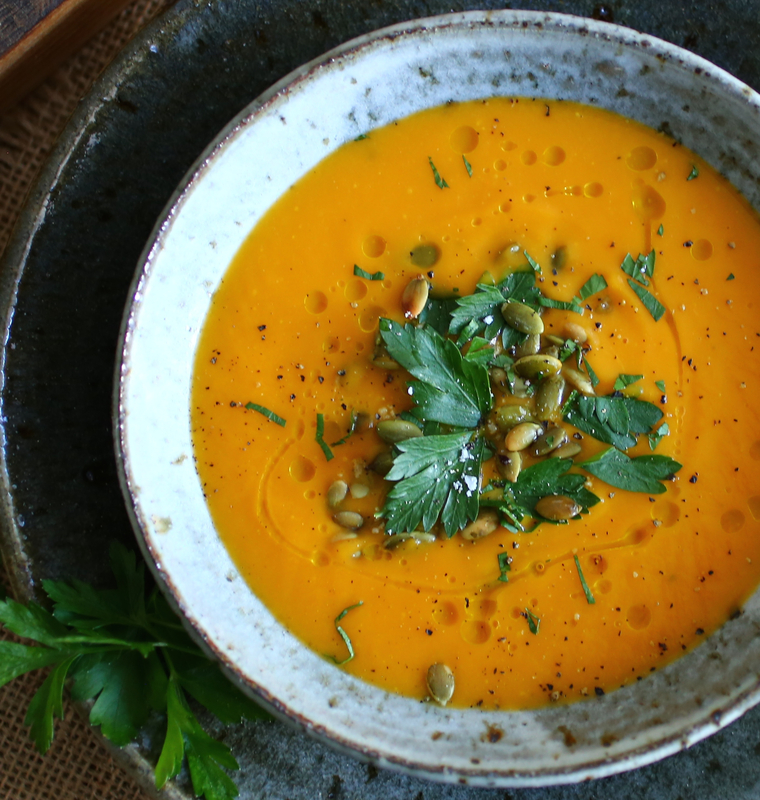 I definitely am in the mood for butternut squash soup right now – this looks so incredible delicious! Thank you so much Thalia!! !